The canton of Vaud is a land of gourmets and one of Switzerland’s largest producers of wine and regional specialties. Its hospitality and sense of sharing have earned it the title of capital of wine tourism in Switzerland. Each town and village values its restaurants, hotels and wine cellars, which are the doors of entry to a real land of plenty. The six wine-growing regions in the canton Vaud - Chablais, Vully, La Côte, Lavaux, Bonvillars and Côtes de l’Orbe - invite epicureans to taste local wines. The other destinations of the canton are no less gourmand and prove it with their welcoming inns and choice restaurants. The capital of the canton of Vaud is a jewel in all seasons. Visitors like to take a stroll from the shores of Lake Geneva through the vibrant downtown area to the cobbled city streets and have a break in one of the shops or restaurants to discover local gastronomy and wines. How fitting the name of “Swiss Riviera” is! A Mediterranean ambience on the shores of Lake Geneva, a pleasant microclimate, good restaurants and excellent wines. 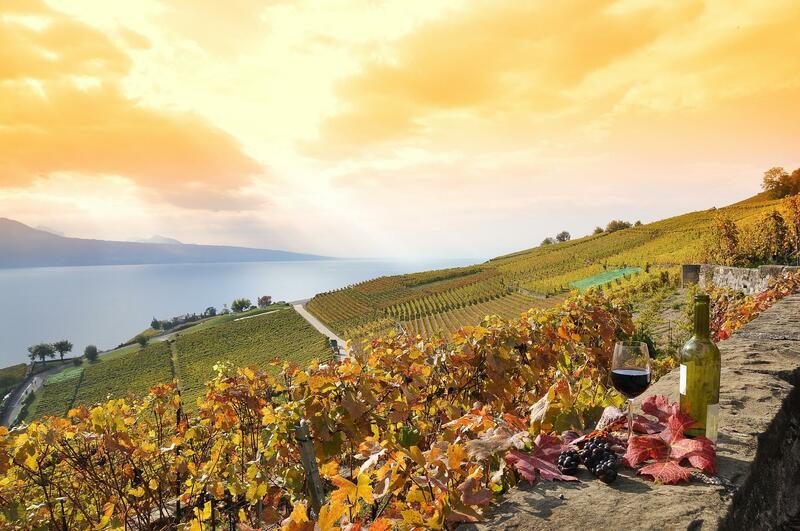 Its vintage wines come from a must-visit vineyard; the terraced vineyard of Lavaux UNESCO. With its narrow streets on the shores of Lake Geneva, its vineyard, country villages and snowy peaks, the region of Nyon is the epitome of Switzerland. Its extensive cultural and culinary history delights many a visitor, whatever their age and interests may be. Encompassing the blue hues of the lake, the verdant Jura forests, the vineyards and a golden countryside, Morges Region enjoys an idyllic setting in the heart of the Lake Geneva Region. This is an authentic destination offering shimmering colours, intoxicating scents, tasty terroirs and cultural wealth. Located on the shores of Lake Neuchâtel, the second town of the canton and its region are well known for their art de vivre. Already the Romans relaxed in the thermal baths, probably while enjoying wines and gourmet specialties. Easily accessible by car or public transport from the plain, the resorts of the Vaudois Alps all have their own special features. Their point in common is certainly a typical art de vivre and a love of culinary traditions, which can be found in countless mountain restaurants. Located in the very north of the canton of Vaud and close to the canton of Fribourg, Avenches honours its past as a Swiss capital. Its alleys, Roman museum and shores of Lake Morat are required places of visit, while the concerts performed in the Roman arenas are part of the not-to-be-missed events. This region is set in the bucolic atmosphere of Lake Neuchâtel in the north of the canton of Vaud and near the canton of Fribourg. The few parcels of vines in this small wine area feature rare treasures that go well together with delicious fish dishes in the nearby restaurants. Located at the tip of Lake Geneva and at the foot of the Vaudois Alps, the Chablais is a reputed winetouristic region. Boasting a castle in the middle of its vineyards, Aigle is the chief town of the district. This beautiful little town is surrounded by Ollon, Yvorne, Villeneuve and Bex, all of which are wine-producing towns with their distinct features.